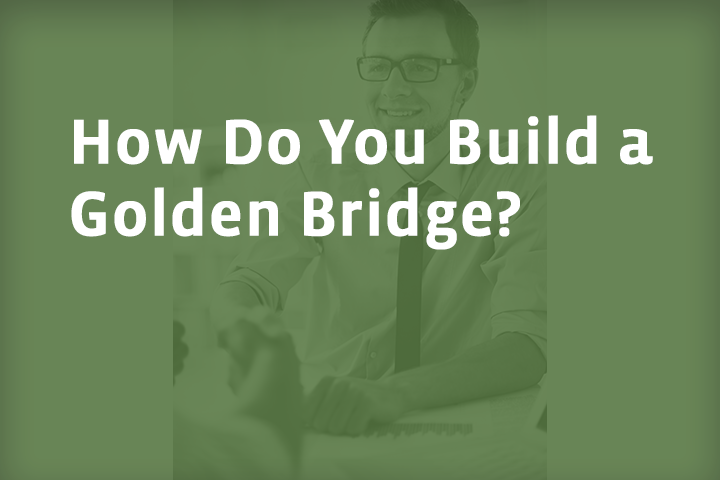 How Do You Build a Golden Bridge? The phrase “Golden Bridge” comes from a Chinese military strategist Sun Tzu, who twenty-five hundred years ago wrote a book called The Art of War. He talked about building your opponent a golden bridge to retreat across. In negotiation I would reframe that positively as a golden bridge for both of you to advance across. Frustrated by the other side’s resistance, you may be tempted to push—to cajole, to insist, and to apply pressure. But pushing may actually make it more difficult for the other side to agree. It underscores the fact that the proposal is your idea, not theirs. It fails to address their unmet interests. It makes it harder for them to go along without appearing to be giving in to your pressure. And it makes the prospect of agreement seem, if anything, more overwhelming. Consequently, the other side is likely to resist all the more. In fact, they may welcome your pressure, for it takes them off the hook of having to make a difficult decision. Instead of pushing the other side toward an agreement, you need to do the opposite. You need to draw them in the direction you want them to move. Your job is to build a golden bridge across the chasm. You need to reframe a retreat from their position as an advance toward a better solution. When I was about thirteen, one local bully gave me nothing but grief all year long. He would knock me down on the grass, or hold my head in the drinking fountain, or push my face in the dirt and give me bloody noses when we had to play football in phys. ed…. This was somebody I feared. He was my nemesis…. Then, I figured, if you can’t beat him, try to get him to join you. So I said to him, “I’m trying to make a movie about fighting the Nazis, and I want you to play this war hero.” At first, he laughed in my face, but later he said yes. He was this big fourteen-year-old who looked like John Wayne. I made him the squad leader in the film, with helmet, fatigues, and backpack. After that, he became my best friend. Young Spielberg discovered the secret of building your adversary a golden bridge. He recognized that the bully needed to feel important. By offering the bully an alternative path to recognition, Spielberg successfully negotiated a ceasefire and turned him into a friend. Building a golden bridge isn’t easy. In a tough negotiation, you might ideally bring in a mediator to help resolve your differences. But that may be neither appropriate nor feasible. So, in the absence of a third party, you need to mediate your own agreement. Building a golden bridge means making it easier for the other side to surmount the four common obstacles to agreement. It means actively involving them in devising a solution so that it becomes their idea, not just yours. It means satisfying their unmet interests. It means helping them save face; and it means making the process of negotiation as easy as possible. No Replies to "How Do You Build a Golden Bridge?"